Every ending has a start. And in our opinion the weekend starts on Thursdays, so what better time to close the loop. While our resident Mad Hatters are champions in creating an experience for the eyes as well as for your taste buds, they are further exploring ways in which root-to-leaf bar tending becomes the core of everything they do and we’ve created lively & innovative Close the Loop Thursdays at Bluespoon to celebrate just that. The creation of conscious craft cocktails at Bluespoon is something to be celebrated! Every first Thursday of the month is now dedicated to fully closing the loop by choosing one ingredient that is commonly wasted in the Bluespoon kitchen and using it as the core of a specialty cocktail, available at the bar for that month. What’s more, this ingredient will further be used to create a perfectly paired bite inspired by the Bluespoon Restaurant menu. We partner with a carefully selected different spirit brand each month that shares our values of care, locality and sustainability. On this spirit the cocktail will be based. The cocktail in question will be highlighted and available for the remainder of the month, to continue to use as much of the wasted produce as possible. Back with a bang on February 7th! 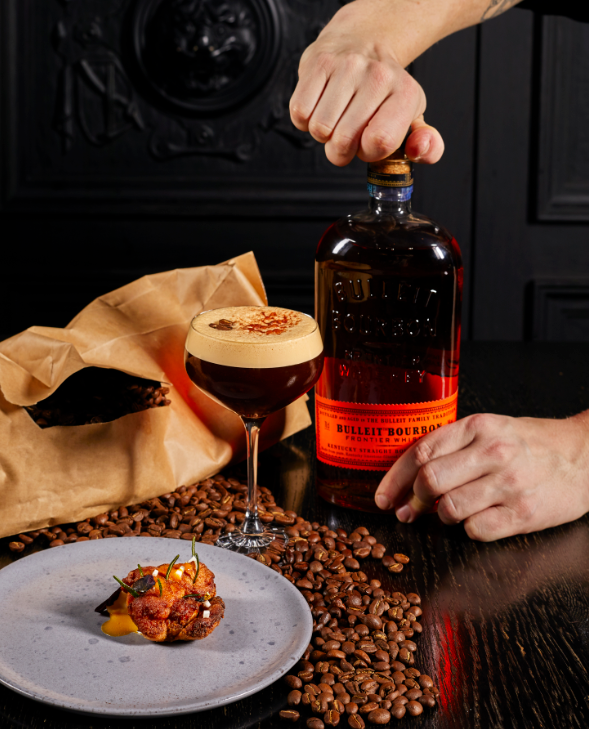 We’re partnering with Bulleit Bourbon and our new coffee partner Common Greens to bring you a new batch of zero waste cocktails. Bulleit Brand Ambassador Alfonso will be joining our Mad Hatters for a guest shift on the evening of February 7th. As they combine forces, you can expect the very best bourbon based cocktails. Perfect to warm you up during one of the coldest months of the year. We’ll all need a good pick me up during one of the coldest months of the year. Welcoming a Bluespoon twist on the Espresso Martini! Using the bold & spicy Bulleit Bourbon and leftover cold brew, this will be a feast for the taste buds. Chef Sander will create a perfectly paired dish with its main ingredients being celeriac, coffee and sweetbread. The waste from this will go straight to the cocktail, and voila, the loop is closed! Join us every first Thursday of the month and see how Head Bartender Martin Eisma and Head Chef Sander Bierenbroodspot dance in perfect harmony to explore the depths of flavour. Check out the recap of our previous events in @bluespoonamsterdam’s Instagram highlights!